Citation Information: J Clin Invest. 2010;120(7):2497-2507. https://doi.org/10.1172/JCI42382. Mutations in the tumor-suppressor gene phosphatase and tensin homolog deleted on chromosome 10 (Pten) are associated with multiple cancers in humans, including T cell malignancies. Targeted deletion of Pten in T cells induces both a disseminated “mature phenotype” lymphoma and a lymphoproliferative autoimmune syndrome in mice. Here, we have shown that these two diseases are separable and mediated by T lineage cells of distinct developmental stages. Loss of PTEN was found to be a powerful driver of lymphomagenesis within the thymus characterized by overexpression of the c-myc oncogene. In an otherwise normal thymic environment, PTEN-deficient T cell lymphomas invariably harbored RAG-dependent reciprocal t(14:15) chromosomal translocations involving the T cell receptor alpha/delta locus and c-myc, and their survival and growth was TCR dependent, but Notch independent. However, lymphomas occurred even if TCR recombination was prevented, although these lymphomas were less mature, arose later in life, and, importantly, were dependent upon Notch pathways to upregulate c-myc expression. In contrast, using the complementary methods of early thymectomy and adoptive transfers, we found that PTEN-deficient mature T cells were unable to undergo malignant transformation but were sufficient for the development of autoimmunity. These data suggest multiple and distinct regulatory roles for PTEN in the molecular pathogenesis of lymphoma and autoimmunity. Lymphomagenesis in PTEN-ΔT mice is T cell intrinsic. (A) Bone marrow chimeras were prepared by transplanting bone marrow from WT mice (n = 4), PTEN-ΔT mice (n = 4), or a 50:50 mixture of the two (n = 8) into lethally irradiated WT congenic recipients. Survival of chimeric mice is measured in weeks after reconstitution. (B) Flow cytometric analyses of T cells in the spleen of representative chimeric mice from A and the contribution of WT (Thy1.1) and PTEN-ΔT (Thy1.2) bone marrow to the peripheral CD4 population. (C) H&E staining of liver and lung from representative chimeric mice 15 weeks after reconstitution. (D) Immunophenotype of lymphoma cells in PTEN-ΔT mice. 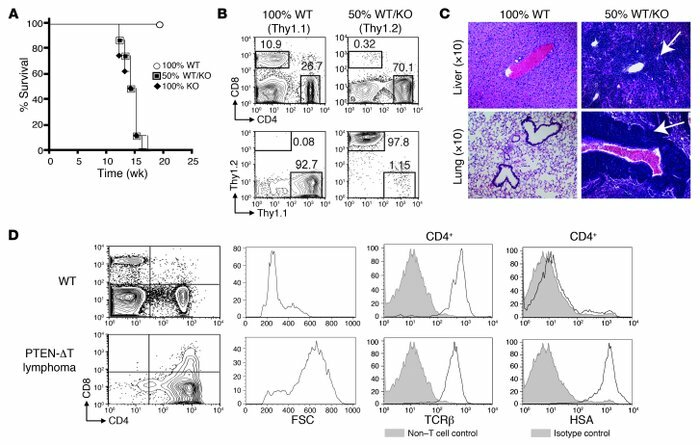 Cells from lymphoid organs of 10- to 17-week-old PTEN-ΔT mice with CD4 single-positive lymphomas were stained with antibodies for TCRβ or HSA and analyzed by flow cytometry. Forward scatter (FSC) is an indicator of cell size. Data are representative of 5 experiments.